Arthritis at the base of the thumb (carpometacarpal joint) is the second most common arthritis in the hand. Similar to arthritis in other areas of the body, it develops from the normal wear process of our joints as we age. Typically, arthritis at this joint occurs after 40-50 years of age, and is much more common in women than men. Why does arthritis develop in this particular joint? All joints are subject to pressure across them with normal use. Walking, for instance, causes pressure across the knee joint that over time can wear out the joint. Ligaments around the joint provide stability so there is more uniform pressure on the joint. 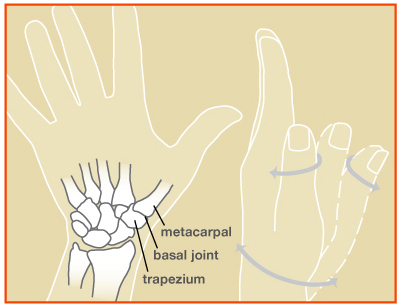 The basilar thumb joint, or thumb carpometacarpal (CMC) joint, has significant pressure across it with normal hand use. The joint can become unstable from ligament stretching or weakening with normal aging. Over time, the combination of instability and high pressure across the joint, leads to arthritis of the thumb CMC joint. What are the common symptoms of arthritis of the Thumb CMC Joint? Pain in the area of the joint is typical (see above diagram for location of joint). The pain can be mild, “achy” pain early on but can progress to severe pain that limits use of the hand. Activities that involve forceful grip or pinch often increase the pain. Patients with thumb CMC arthritis often have difficulty opening jars or bottles. Use of keys can be painful as well as pulling heavy items around the home. A deformity may occur over time making it difficult to hold objects that have a large diameter. The physician will usually get an x-ray of the hand to confirm the diagnosis. Treatment often depends on the severity of the symptoms. In patients with mild symptoms, activity modification to avoid forceful pinch activities and occasional use of anti-inflammatory medications may be all that is required. If symptoms are more severe, splinting and cortisone injections can be used. In severe cases which do not improve with conservative treatments, surgery may be indicated. What is involved if surgery is recommended? Surgery can be performed on an outpatient basis under regional anesthesia. Surgical techniques vary, but typically involve removal of the trapezium bone, placing a spacer where the bone was removed, and sometimes reconstructing the joint ligaments. The patient’s own tendons can be used for a cushion/spacer and to reconstruct the joint, if necessary. In some patients a fusion of the joint or joint replacement can be considered as an alternative to the above surgery. What are possible complications of this surgery? Although complications are rare, infection, blood vessel injury, nerve injury, continued pain and thumb deformity can occur after the surgery. At 10-14 days after surgery, the stitches are removed from the incisions, and the patient is placed into either a custom splint or cast. The repaired thumb is protected for about 6-8 weeks with a splint. Hand therapy strengthening program is started at approximately 8 weeks after surgery. Full use of the hand is usually possible 10-12 weeks after the surgery. Image and video provided by the American Society for Surgery of the Hand. The material provided on this site is intended for general information only and does not constitute medical advice. This site does not replace direct evaluation by a physician.